Nelly Ngomane should have been proud of her job as a school teacher in a rural area. But Ngomane, of Emangweni Village in Mpumalanga, found the classroom boring. Dressing formally every day and writing on the chalk board was not for her. She dreamed of working in the fields wearing boots and overalls. 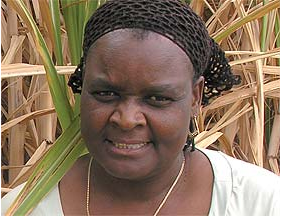 In 1995 Ngomane, the mother of a teenage boy and girl, left teaching. She started planting sugar cane at home and sold it to a local sugar cane mill. But she made little profit because her yard was too small. Today, thanks to the Land Redistribution for Agricultural Development (LRAD) pro-gramme, Ngomane’s dream of becoming a successful farmer has come true. She is now the proud owner of a 41,2 hectare farm worth R2,4 million. The LRAD is a programme of the Department of Agriculture and Land Affairs. 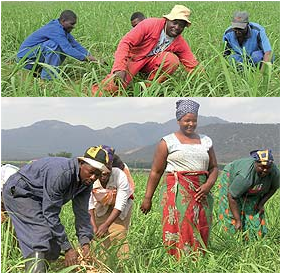 Government uses this programme to help previously disadvantaged people who want to become farmers, but do not own land. LRAD gives such people the chance to buy farms from white owners. It also provides them with money to start farming. In Ehlanzeni District Munici-pality in Mpumalanga, the LRAD bought about 260 hectares of sugar cane farms in different local municipalities. The farms cost about R16 million. Seven people including Ngomane were chosen from the many who applied for the opportunity. The farmers sell their sugar cane to TSB Sugar, a local sugar mill. People with good knowledge about farming, including the previous farm owners, help the new farmers with advice. Vuk’uzenzele visited some of the sugar cane farms in Mpumalanga. Elliot Ngomane (not Nelly’s relative), who benefited from the programme, told us that things were tough at first. He and three of his family members identified a farm to buy. They received a loan of R1,2 million from the LRAD to buy a 53,5 hectare farm. Because the farm was worth R2,7 million, the Ngomanes borrowed an extra R2 million from the bank. The bank wanted them to give money every month to repay the loan, but they hadn’t made any profit yet. "Farmers only make money after the harvest, not every month," Ngomane said. "But in the past few months we have started making some profit and we are no longer behind with our payments. The future looks bright." Mpumalanga MEC for Agriculture and Land Administration, Madala Masuku, warned farmers to be wise about taking loans from banks. "Farmers should not borrow more than they are able to repay," Masuku said. "We are trying to arrange with the banks for repayment methods that suit farmers better, so that they can start making profit immediately." Government wants 30 per cent of land to belong to previously disadvantaged people by 2014. Before 31 December 1998, government received 79 696 land claims from all over the country. Of these, 71 645 have been settled. You must identify the land you want to buy. Then ask the Department of Land Affairs for a loan, called a LRAD grant. To get a LRAD grant of R20 000, you must have about R5 000 capital available. This capital does not have to be money; it can be in the form of farming equipment or cattle. Once you have received your first grant, you can apply for more money. Before getting a grant, you must undergo training to get proper farming skills. The department will also give any legal help you will need for buying the farm.